I like this pattern, but the arm hole (armscye?) annoys the heck out of me... every single time I make it. Instead of curving in the back, it meets at a right angle. I have to stitch wider than 5/8" at the point to fully encase it. I'm ready to gently re-draft the bodice because setting in fitted elbow-length sleeves at that spot is a pain. Is it me? The style? Is this really The Way It's Supposed to Be? Oh... I realize this isn't a Truly Victorian pattern (Heather doesn't offer patterns from this period), but I'm hoping someone here is familiar with it and can offer some good advice. Thanks! I am not familiar with this pattern. But in general terms for this time period, they didn't know how to draft sleeves and set them in very well. So that square spot at the back its pretty common for the period. 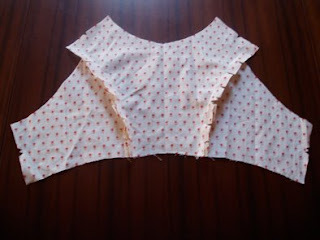 Usually though, the sleeve is cut super wide at the back to compensate for that narrow spot on the back The sleeve may even have a matching square spot. I hope this helps. Thanks, Heather - that's probably it. I wasn't sure whether the issue was historical accuracy or a drafting error. The sleeve doesn't have a corresponding square spot. I might just draft it out to save myself some future irritation. ...which means I can re-draft that spot without sacrificing historical accuracy. Yay! Oh, and a little late, but... thank you Heather! If you offered a drawstring pattern I would have snatched it up in a second. Your patterns are among the best I've ever worked with, and THE best for mixing and matching various elements; they make sense, they go together perfectly, and your directions are clear and accurate. I so prefer them to anything else and would use them exclusively if I could. My apologies, but I thought I had already posted this.